“The Bachelorette” premiered on ABC Monday night, and this year’s star JoJo Fletcher already has her eyes set on a clear frontrunner. And it’s none other than Jordan Rodgers, brother of Green Bay Packers quarterback Aaron Rodgers. Jordan was actually the one who received the first proper kiss, after JoJo was forced into an awkward peck with one contestant who attempted to seduce her with a cootie catcher. But let’s start from the beginning of the episode. JoJo got together with former “Bachelorette” contestants Kaitlyn Bristowe, Desiree Hartsock and Ali Fedotowsky to seek advice on her quest for love. One talking point was whether JoJo would say “I love you” to more than one guy, referring to last season where Ben Higgins told both JoJo and winner Lauren Bushnell that he loved them both, but ended up breaking JoJo’s heart. Wearing a gold sparkly gown, JoJo looked absolutely stunning as the men were driving up to the Bachelor Mansion in limousines: “Bring on the men!” she exclaimed. And out came Jordan, who told her a cute story of how his parents only knew each other for three months before getting engaged and have been married for over 30 years since. Another man stepped out of the limo with a bottle of wine and told her to drink it straight from the bottle per “Fletcher Tradition,” referring to when JoJo’s mom drank straight from a bottle during Ben’s hometown date last season. There were awkward side hugs, dropped cue cards, and serenading, and one guy even stepped out in a kilt, telling her he is half Scottish half Chinese but thankfully, “Scottish below the waist,” he quipped. Santa Claus made an early appearance as well, one contestant gave JoJo “permission to squeeze my balls,” and another gifted JoJo a piece of toast. 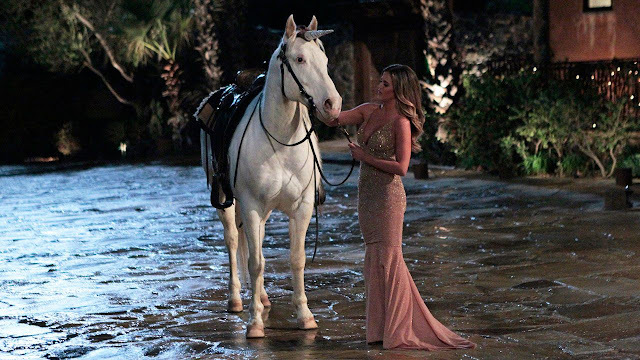 Then a unicorn trotted to the Bachelor Mansion, once again referencing last season where JoJo wore a unicorn mask when she first met Higgins. Flash forward to the cocktail party, which, as per usual, had extremely awkward moments and everyone was talking behind everyone’s backs. Alex, in the Marine Corps, had a “Napoleon complex,” according to the other guys in the house, as he did push ups with JoJo sitting on his backside, and all of the men went on to make fun of his height. And as always, during the first cocktail party at the Bachelor Mansion, alcohol was flowing — and one contestant definitely had a couple too many. Daniel Maguire, “The Canadian Guy,” not only shared an extremely awkward conversation with JoJo, but also took off his clothes to reveal “man underwear” and poked the other men in the house in the belly button. And while JoJo had her on-camera interview behind-the-scenes, two contestants switched off walking into the room to talk to the Bachelorette, totally unaware that JoJo was filming.